The location is close to some of our exploration permits and gives an opportunity for the community to benefit from our presence in the area. In addition to school we also built a Medical Clinic and a bridge there. The bridge will permit the farmers on the opposite side of the river to bring their produce to the main road and reach markets of Kolwezi. 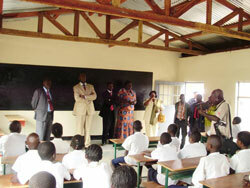 The Provincial Minister of Mines Mr Juvenile Kitugua attended the opening ceremony on 20th November 2009. It took 6 months to construct the school, medical dispensary and a house for the chief of the village. The school accomodates 110 boys and 92 girls, from age 5 to 12 years old. The cost was approximately $118,500.